Hailed as one of the Best Airport Hotels in the world, the Crowne Plaza Changi Airports modern architecture combined with hints of nature gives you a glimpse of what to expect in Singapore â a modern garden city. Just steps away from the departure and arrival hall, rejuvenate in the comforts of our calming room or visit our spa for a range of massage treatments. A cutting-edge air-conditioned linkbridge connects the hotel to world-class Changi Airport Terminal 3, with Terminals 1 and 2 accessible by SkyTrain. Weâre 10 minutes from Changi Business Park and 25 minutes from the city by taxi or MRT. A top airport hotel offering contemporary soundproofed rooms with comfortable beds and spacious modern bathrooms, it is the perfect hotel for a quick stopover between long-haul flights. Crowne Plaza Changi Airport is more a business hotel with a resort ambience than an airport hotel. Discover the tropical resort hidden within the hotel with courtyard gardens and a landscaped pool area. Youâll find peaceful garden views from the Lobby Lounge or al fresco courtyard. Immerse yourself in 70s glamour at barâ75 with intimate nooks for cocktails, pick your own fish from the tank and dine Cantonese-style at Imperial Treasure or have a buffet of international delights from Azur. Host a tropical garden reception, conference or wedding in our seven meeting rooms and ballroom. 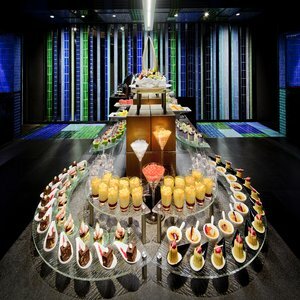 Stunning design and the latest technology ensure a stylish and successful event at Crowne Plaza Changi Airport.